Clinical Manchester United increased the pressure on Liverpool manager Brendan Rodgers as they capitalised on some poor defending to run out comfortable victors at Old Trafford. Rodgers - who dropped struggling goalkeeper Simon Mignolet for Brad Jones - can point to a succession of brilliant saves from United's David De Gea and a controversial second goal from Juan Mata as significant factors in defeat. This, however, will do little to ease the growing concerns for Rodgers and Liverpool, with the memory of their thrilling 3-0 win here in March - in a sequence that almost took them to their first title in 24 years - seeming an age away. United captain Wayne Rooney gave them an early lead and Liverpool had every right to feel aggrieved when Mata headed in from a clearly offside position to take the game away from them just before half-time. Even before United took the lead, De Gea made an important save from Raheem Sterling, denying the England youngster on four occasions as well as producing three vital contributions to stop Liverpool substitute Mario Balotelli getting his first Premier League goal for the club. Robin van Persie's third for United at the end of a lightning counter-attack only added to Liverpool's pain and gave the scoreline a lopsided look given the amount of work done by De Gea. United's sixth successive league win continued United's resurgence under manager Louis van Gaal and put Liverpool's decline since they came so close to winning the Premier League into even sharper relief. Liverpool now trail third-placed United by 10 points. Liverpool's owners, Fenway Sports Group, intend to give Rodgers until the end of the season at least to turn matters around given the credit he still has after last season, but after a miserable Champions League campaign was confirmed by their exit at the group stage following the midweek draw with Basel, these are crucial days for the northern Irishman. He now faces a huge seven days with a Capital One Cup quarter-final at Championship leaders Bournemouth on Wednesday before Arsenal visit Anfield next weekend. The reshuffled team sent out at Old Trafford by Rodgers gave Liverpool and their manager cause for optimism in an energetic early spell but the momentum shifted crucially in the 13th minute as De Gea saved from Sterling at one end and Rooney scored at the other. In the space of 25 seconds, Liverpool should have taken the lead but then found themselves behind as Antonio Valencia nutmegged Joe Allen and pulled the ball back for Rooney, who scored with Jones diving in the wrong direction. De Gea thwarted Sterling - utilised as a lone striker - once more before United doubled their lead in controversial fashion five minutes before half-time. Mata was clearly offside when he headed in after Van Persie got a slight touch to Ashley Young's cross. There was daylight between Mata and the last Liverpool defender, so it can only be assumed linesman Mike Mullarkey did not believe Van Persie got a touch. It was a demoralising blow for Liverpool who, having had to replace Glen Johnson with Kolo Toure in the first half after he suffered a groin injury, replaced Adam Lallana with Balotelli at the restart. Whereas United had taken the chances that had come their way, Liverpool had wasted every opportunity, as Sterling did once more early in the second half. Michael Carrick, who had been immaculate, inexplicably allowed Jonny Evans' pass to roll straight to Sterling, who hesitated, even when he seemed to have rounded De Gea, allowing the goalkeeper to get back and save. De Gea's development into a world-class goalkeeper has been confirmed by a series of stellar performances this season and he showed his quality and reflexes again to turn Balotelli's close-range shot on to the bar. 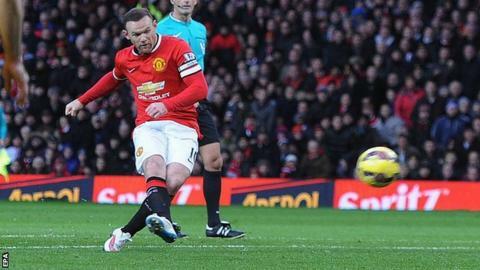 The difference between the sides was illustrated once more as Van Persie wrapped up United's win. Dejan Lovren scooped Rooney's pass hopelessly into the path of Mata, who found Van Persie to score, with Jones once again on the wrong foot. Match ends, Manchester United 3, Liverpool 0. Second Half ends, Manchester United 3, Liverpool 0. Corner, Liverpool. Conceded by Patrick McNair. Attempt blocked. Falcao (Manchester United) right footed shot from outside the box is blocked. Substitution, Manchester United. Patrick McNair replaces Phil Jones. Corner, Manchester United. Conceded by Bradley Jones. Attempt saved. Robin van Persie (Manchester United) left footed shot from the centre of the box is saved in the top centre of the goal. Attempt saved. Mario Balotelli (Liverpool) right footed shot from the centre of the box is saved in the centre of the goal. Assisted by Lazar Markovic with a through ball. Attempt missed. Mario Balotelli (Liverpool) right footed shot from outside the box is close, but misses to the left. Assisted by Raheem Sterling. Attempt saved. Mario Balotelli (Liverpool) right footed shot from the centre of the box is saved in the centre of the goal. Assisted by Jordan Henderson. Attempt saved. Robin van Persie (Manchester United) left footed shot from outside the box is saved in the centre of the goal. Assisted by Ander Herrera. Offside, Manchester United. Falcao tries a through ball, but Robin van Persie is caught offside. Substitution, Manchester United. Falcao replaces Wayne Rooney. Goal! Manchester United 3, Liverpool 0. Robin van Persie (Manchester United) left footed shot from the centre of the box to the centre of the goal. Assisted by Juan Mata. Substitution, Manchester United. Ander Herrera replaces James Wilson. Substitution, Liverpool. Lazar Markovic replaces Alberto Moreno. Offside, Liverpool. Philippe Coutinho tries a through ball, but Mario Balotelli is caught offside. Corner, Liverpool. Conceded by Robin van Persie. Attempt blocked. Mario Balotelli (Liverpool) right footed shot from very close range is blocked. Assisted by Kolo Touré. Attempt missed. Kolo Touré (Liverpool) right footed shot from outside the box misses to the left. Assisted by Steven Gerrard with a headed pass following a corner. Attempt saved. Mario Balotelli (Liverpool) right footed shot from the centre of the box is saved in the top centre of the goal. Assisted by Raheem Sterling. Attempt missed. Robin van Persie (Manchester United) left footed shot from the centre of the box is close, but misses to the right. Assisted by Antonio Valencia. Read more on Man Utd v Liverpool: A strange kind of sporting love affair?